With the continuous push for ever more stringent life-safety related building codes, it has become commonplace for historically non-seismic regions of the country to require seismic restraint of MEP (Mechanical, Electrical and Plumbing) equipment. Isotech manufactures a wide variety of seismic mounts and restraints that will control the motion of equipment, piping and ductwork during a seismic event. Proper sizing and placement of seismic restraints and accurate calculation of anchor bolt forces is imperative in adequately restraining equipment against seismic effects. Isotech seismic mounts and restraints are designed to provide the strength and isolation necessary to maximize the chances of these systems remaining attached to the building structure. Isotech will consult with engineers and architects to determine the best possible seismic solutions for your projects. Seismic rated mounts and restraints will control the motion of equipment, piping and ductwork during a seismic event. Isotech seismic isolators are IBC compliant. Rugged steel housing is designed to handle high wind and seismic forces. Housing serves as blocking during equipment erection. Top plate may be welded or bolted to equipment – allowing flexible design options. Housing heights are identical within each series. Easily accessible bolt holes permit simplified installation. Isolators manufactured on robotic welders to maintain consistent quality. Powder coated housings and springs offer outstanding corrosion resistance. Springs are easily accessed for replacement if loads change. Color-coded springs permit proper identification of load capacity and simple inspection. Elastomeric acoustical cup allows for better vibration isolation. 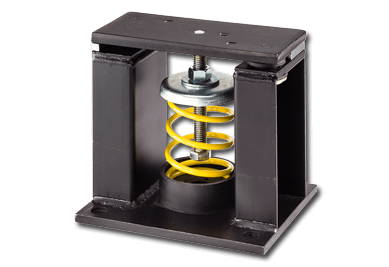 3/8″ spacer block allows for ease of installation by maintaining the installed height of the equipment and setting the proper air gap for seismic code compliance. All seismic isolators are manufactured using modern robotic welders. The standard finish on the housings and springs is powder coating and all hardware within the mounting is zinc electroplated. The housings can also be ordered as hot dipped galvanized for superior corrosion resistance.